Never quite as trendy as Stardisc or Syd Scarborough's, Gough and Davy helpfully doubled as an instrument shop and ticket outlet so was generally worth a visit on a Saturday afternoon. Most notable LP purchase: The Blue Ridge Rangers in 1973. The shop is still in existence but now sells musical instruments only. Comment: Peter Greendale. (Nov 18, 2013) Roy Bainton said:A bit of clarification here. 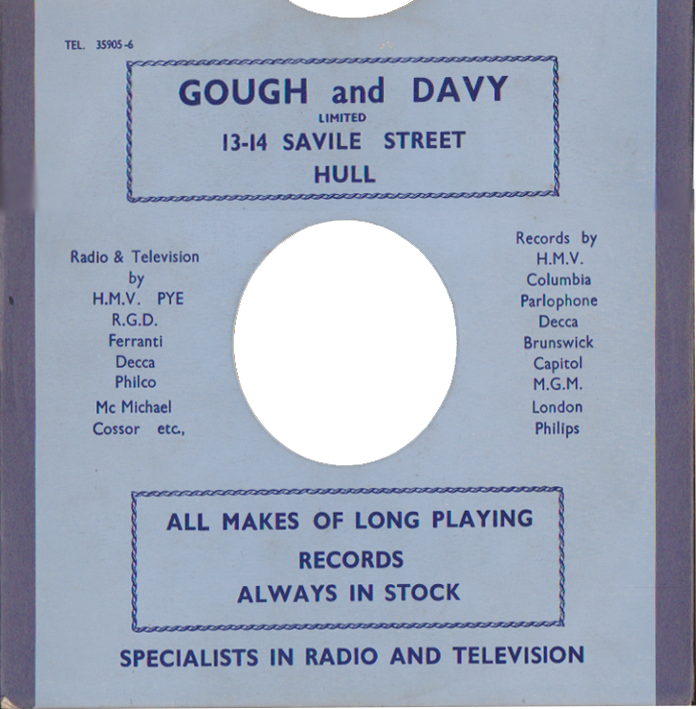 Gough & Davy exists today only by name in one location, under the City Hall in Hull, selling musical instruments. When I joined them in Savile Street, Hull, where they'd been for almost a century in 1975, as manager of their busy records department, they had stores in Scarborough and Grimsby, and in 1976 we opened a big store in York, and I was given the task of organising the grand opening, with the pianist Joseph Cooper cutting the ribbon, and professor Mellors of York University in attendance. That store, as well as Scarborough and Grimsby, has now gone. I beoiev the Grimsby branch today is an outpost of Gregg's - very apt when I consider all the sandwiches we used to consume behind the counter and in my office. ROY BAINTON, EX-MANAGER, GOUGH & DAVY GRIMSBY.